I just bought my first pinball two week ago, a Space Station (Williams, System 11), and encountered my first malfunction. Because I'm a totally unexperienced, I hope you can help me. A few days ago I noticed that the left flipper sometimes got stuck in it's activated position. An inspection under the table showed that the EOS switch gave of big sparks when the flipper was activated. On closer inspection I saw that the capacitor leg was broken off and that the EOS switch was covered in a white deposition (see photo's). The flipper plunger can be moved easily in the coil manually and the flipper action is still strong when controlled electrically. I would definitely advise replacing that EOS switch as it looks pretty pitted. 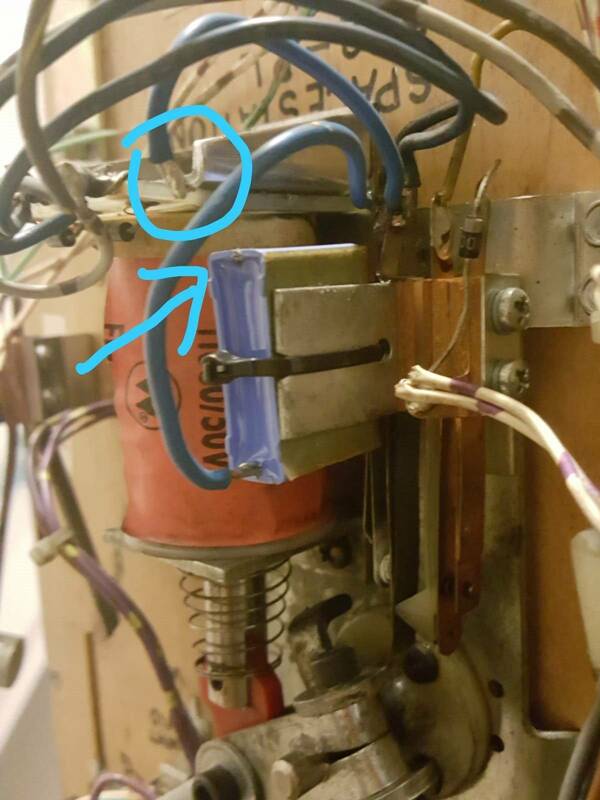 As far as the flipper getting stuck, is it mechanical or electrical? To find out, get the flipper stuck again and then shut off the machine. If the flipper drops when the power is off, the cabinet switch for the flipper button is probably stuck. 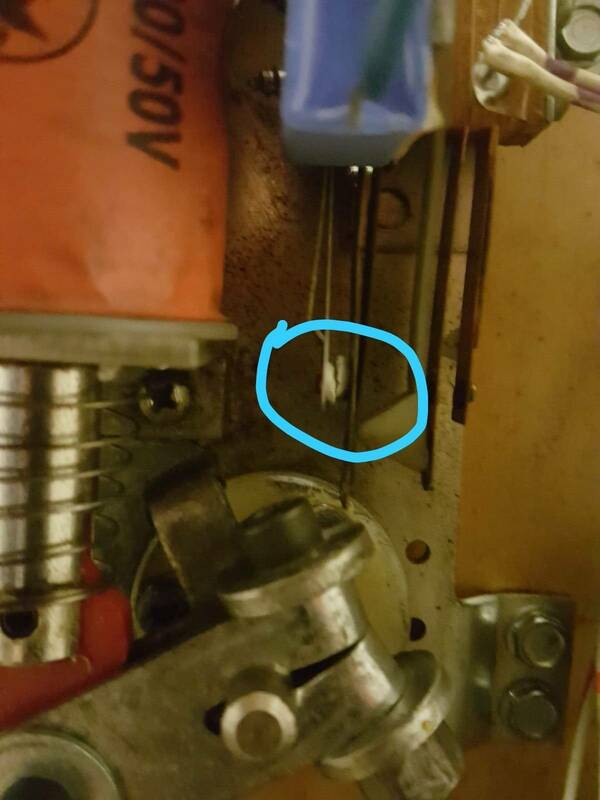 If the flipper stays stuck, something is physically binding in your flipper mechanism. This is most likely as a System 11 game doesn't have flipper driver transistors that could get locked on. Normally I would say "Just make everything fresh and get a rebuild kit for both flippers," but since you're new to the hobby, let's start with just tweaking what you have. Remove the bracket holding the coil in place (the bracket touching the big spring) and get the plunger out of the coil. Inspect the end. Is it smashed or mushroomed? If so, take a hex wrench and an allen wrench and remove the coil plunger. If you can't reach it, use the same tools to remove the flipper, and the crank assembly will come right off. Grind off the mushroomed metal hanging over the edge of the plunger with a bench grinder, or elbow grease and a file if you don't have one. Reassemble flipper. Be careful with the wrench combo as I have nightmares of the wrench slipping every time I do it. Lots of nasty edges on the bottom of a playfield. If these instructions are difficult to visualize, I'm sure we can make you a diagram. As a follow up, here’s basically everything you need to know. Great info in here! Rebuild both flippers. Everything but the coils. I have done what northerndude suggests by following vids guide. It is definitely worth it! Simple soldering skills and take pics of everything before and during process. Yes, in hindsight I suppose just jumping right in can be the best way to learn these things. Yep. That’s what I did. Awesome learning experience. Here is everything you need. Just $26.95 plus shipping. I would suggest buying the whole kit and if you're not comfortable doing the rebuild just yet, you'll have the parts later when you're ready. Will be the best $27 you ever spent! Thanks for all the advice. I have ordered all parts needed. I'll keep you guys posted. This is the upgraded kit they have, It puts the spring on the outside bracket. This would be the one vid1900 suggested in his flipper rebuild. It's the one I used for SS and F-14 works great. The only thing that bugs me about the pinball life kits is they dont include the bushings. 95% of the time they're worn out too. I always replace the bushings when I do a rebuild. I wish Terry would include those in the kits. I agree, those get replaced with rebuilds most of the time. Esp on older pins that have not been rebuilt in a long time. Does the capacitors have "plus" and "minus" end? can i connect them both ways? Agreed. I always replace flipper bushings and the grommit that the linkage rests on; the kits from Marco and Pinball life are missing those. No polarity on the cap that’s installed across the EOS switch. Either lead can go to either switch terminal. I did the rebuild yesterday and I went very smoothly. To any future newcomers to the hobby: don't be intimidated. I don't consider myself very handy, but even so found the procedure easy. And the effect is very big! Planning to rebuild the right flipper next week (even though that one isn't broken). Thanks for all advice from everyone.